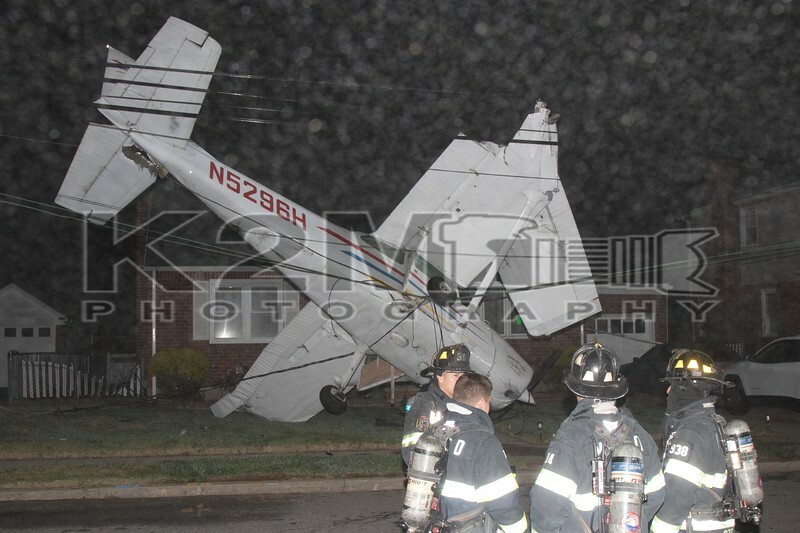 At approximately 22:20 hours on the night of Sunday, April 14th, 2019 the Valley Stream Fire Department was dispatched to a general alarm for a plane into a house and house fire on Clarendon Drive off North Drive. When firefighters arrived on scene, they were met with a single engine Cessna tangled in the wires in front of 113 Clarendon Drive. There was no fire or houses involved. The three occupants of the plane were able to self-extricate and were not seriously injured. After being checked out by EMS personnel they refused medical attention and were not transported. The plane, a rental that originated in Republic Airport in Farmingdale, flew to upstate Niagara and was returning to Long Island. The pilot, who was attempting to land in heavy fog, circled Republic Airport multiple times but became disoriented. The plane was redirected to JFK Airport in Queens; however, the pilot became disoriented again and ran out of fuel forcing the Clarendon Drive landing. The accident resulted in several houses losing power. Firefighters stretched one precautionary hand line during their operation and all fire department units were under the command of Valley Stream First Assistant Chief O’Brien . Click here to see the rest of the images from K2M Photography’s gallery, Clarendon Drive [4-14-19].